The Tenda Nova MW3 mesh WiFi system uses multiple connected mesh devices with dual band technology to deliver a fast and reliable WiFi signal that is distributed evenly around your home or office. The MW3 system supports up to 5 mesh devices that allow up to 40 devices to be connected simultaneously and uses MU-MIMO technology to allow multiple users to be connected without loss of performance. 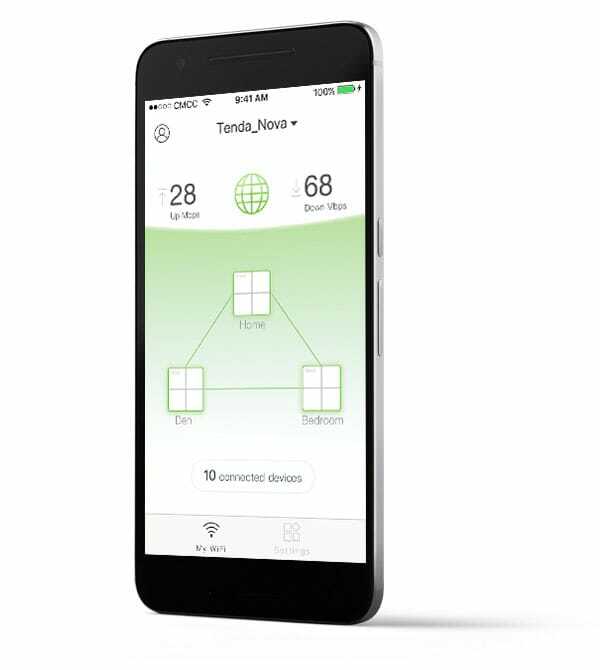 To set up the Tenda Nova MW3 system simply connect one of the units to your existing router and use the easy to use Tenda mobile app to guide you through the reset of the process. Other MW3 modules can be located around your home to evenly distribute the WiFi signal. The Tenda Nova set-up app is available free of charge for Android™ or iOS™ devices. If you need more coverage simply add more modules up to a maximum of 5 MW3 modules. For large properties that require even greater coverage take a look at the more powerful Tenda Nova MW6 system that has more powerful antennas and can accept up to 9 modules. Why buy the Tenda Nova MW3 WiFi Range Extender Mesh System from Connectec?